Mailbag time! If you’ve got a question for a future fantasy baseball post, e-mail grantlandfantasy@gmail.com, or do as these fine folks did by tweeting questions to me here: @jonahkeri. 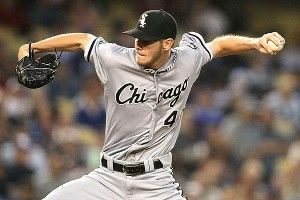 Where does Chris Sale rank in a pitcher-heavy 12-team keeper league? Worth keeping or trading for a first overall pick? We’ve covered Sale before, and his rise has been impressive: 9.2 K/9, 2.5 BB/9, 2.46 ERA, 2.55 FIP, fifth in MLB in Wins Above Replacement for pitchers. Concerns about in-game stamina have faded away, with Sale throwing four straight starts of seven innings or more before having that streak snapped against the Dodgers last week. With Sale either reaching or approaching several sample-size milestones, we have to start taking him seriously as a top-tier pitcher. should we start to worry about his increased workload? Tom Verducci tracks the Year-After Effect (also known as the Verducci Effect), which monitors pitchers 25 and younger who throw 30-plus innings more than they did a year earlier. The study is meant to track pitchers the year after a big workload jump, rather than follow them during the season in which the jump happens. Just as the Verducci Effect has its share of problems, so too does measuring pitcher performance during actual innings-jump years. For one thing, there’s a raging selection bias in play: If a young pitcher throws a ton of innings, odds are he’s at least competent, and possibly very good. That leaves us with little more than a general sense of ickiness for pitchers who work much harder than they ever have before, in Sale’s case, going from the bullpen to the rotation and already surpassing his single-season high for innings pitched as a professional. So what to do? With Sale, as with Cardinals innings jumper Lance Lynn, it might be worth exploring the trade market, if only as a hedge. Without knowing the specifics of your league, I couldn’t say whether either pitcher should fetch more or less than a no. 1 pick. But you shouldn’t necessarily shop either pitcher out of desperation too. Sale and Lynn have put up numbers that rival established aces like CC Sabathia and Matt Cain. Don’t sell low out of fear. Due to shrewd drafting I was able to pick Bryce Harper, Mike Trout, and Chris Sale in late enough rounds for them all to be keeper eligible in my league. Unfortunately I can only keep 2. Pitching is generally more valuable than OF but these are generational talents. Should I try and trade one of the three for an elite player at the same position? In general, would you recommend keeping certain positions over others? I do agree that Harper and Trout are so good that they transcend whatever weird rules make pitchers more valuable than top position players in your league. Then again, everything boils down to perceived value. Trout’s hitting .338/.397/.528 and is assembling an MVP-level season; Harper’s not far behind at .291/.372/.514 with power and speed. A team building for the future would likely pay an ungodly amount to acquire either the 20-year-old Trout or the 19-year-old Harper — far more than they’d likely pay for Sale. I’d shop all three players and see what shakes out. If you could get some kind of Verlander/Braun package for Trout-plus or Harper-plus (not unreasonable given how deadline deals often work in keeper leagues), you’d have to give that some serious thought. Is there anything to the notion that it’s bad to have several players or multiple elite players from the same team? Does having Prince and Miguel Cabrera or the entire Braves outfield reduce any of their individual values? More prone to streaks related to the team’s performance? Team performance isn’t all that relevant when evaluating real-life value, or say, MVP races: Baseball is a ruthlessly individualistic game, where players rely less on teammates’ contributions than in any other major team sport. No matter what the old wives’ tales might claim. But fantasy stats are a little different: Stats like runs scored, RBIs, and wins, which are iffy indicators of a player’s real-life value, are at the heart of most roto leagues. So yes, if a whole team goes cold and you have five players on your roster from that team, you’d get hurt in the short-term. But streaks don’t make much difference in leagues that don’t have weekly head-to-head scoring. The long view is what matters here. Occasional slumps notwithstanding, targeting multiple hitters from a high-offense team in a hitter-friendly park is a strategy that should be embraced, not avoided. If you have Josh Hamilton, Elvis Andrus, and Adrian Beltre, or Robinson Cano, Derek Jeter, and Nick Swisher, you’re probably not complaining right now. Will Matt Kemp ever take the mantle of Indisputable Best Fantasy Player Alive or will his inconsistency (2010) and injuries (2012) keep him from assuming the title that Pujols, A-Rod, Bonds and others have held in the past? The funny thing about fantasy supremacy is that it can sometimes differ from real-life supremacy. For instance, Rickey Henderson’s 130-steal explosion in 1982 topped everyone else for fantasy value that year. But Rickey also posted a more modest .267/.398/.382, tied for ninth in WAR, and finished just 10th in MVP voting. Of course Kemp can be the total package when everything breaks right. His 2011 season, in which he hit .324/.399/.586 with 39 homers, 126 RBIs, 115 runs scored, and 40 steals, did in fact make him the Indisputable Best Fantasy Player Alive, at least for one season. He was so great that he famously proclaimed he’d go 50-50 this year, which might’ve broken our ability to calibrate fantasy value forever. It’s way too early to say that Kemp’s done as an elite fantasy performer or that he can’t be no. 1 again — the guy’s only 27 years old. But after suffering through this many hamstring problems, and knowing how valuable he is to the Dodgers, I’m not sure we can ever again count on him to put up big stolen base numbers. And if Kemp has to derive the bulk of his fantasy value from his power in the future, he risks getting outgunned by players like Josh Hamilton (no. 1 in fantasy value this year) and Ryan Braun (no. 2), who are similarly talented but play in much more favorable ballparks for hitters. So yes, if I were a betting man, I’d say that Kemp had his moment on top, and might not ever get there again.